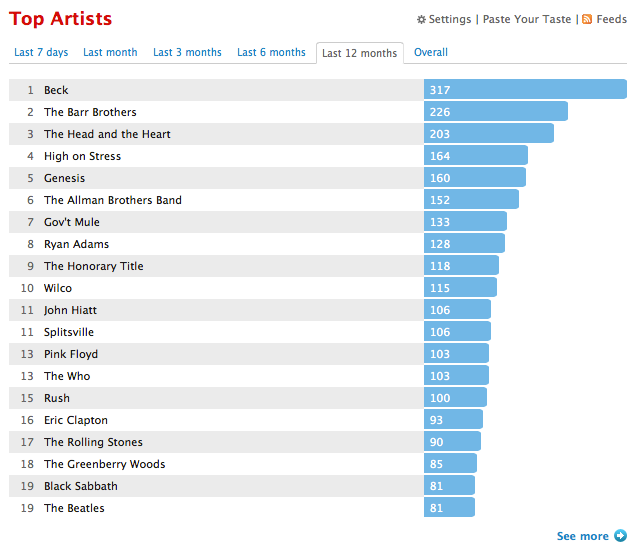 Beck at #1 is no surprise as his 2014 release Morning Phase was in super heavy rotation for me. That along with an early year release make his appearance at the top of my chart a sure thing. The Barr Brothers Sleeping Operator had an October release so slid in at #2 despite heavy play. These two are the top contenders for my album of the year, hopefully I’ll be able to choose one by the end of this post. The Head and the Heart are still running strong on their prior releases to finish third this year while High on Stress finishes at #4. You may remember they were a twitter / kickstarter find who I discovered this year and well worth giving a listen if you are unfamiliar. They broke up (sad) but front guy Nick Leet has formed a new band so looking forward to hearing more from him / then in 2015. Genesis rounds out the top five, surprisingly enough. I guess even just a couple of listens to Lamb Lies Down on Broadway will dump some volume in to their counts. Not too many surprises in the rest of the 20. The Greenberry Woods / Splitsville are newer finds for me, also well worth digging in to if you’re looking for something new. 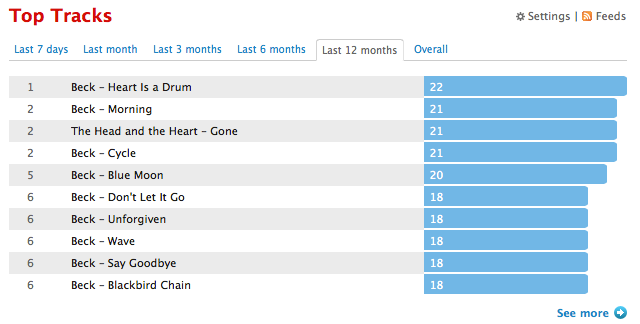 Well – you’ve essentially got Morning Phase here for top tracks but “Gone” by The Head and the Heart snuck in there, and deservedly so. Not much to discuss here. For Top Albums I guess I’m just going to list the releases this year that have fallen in to my regular listening bucket. Lots of stuff came out this year but very little made a big impact on me. Here are the ones I remember. 1) Beck – Morning Phase / I just adore this album. It’s moody, melancholy, textured, layered and gorgeous. I loved Sea Change and this is even better than that. 2) The Barr Brothers – Sleeping Operator / I was eagerly anticipating this one based on the strength of their debut and wasn’t disappointed by the follow-up. “Come in the Water” is surely my song of the year. Great stuff. 3) Ryan Adams – Ryan Adams / He just keeps getting better and better and this eponymous release is tremendous. 4) High On Stress – Leaving Mpls / Straight ahead Rock & Roll from Nick and the gang. Their final release, a wonderful cap on a really great set of albums. 5) Jenny Lewis – The Voyager / Catchy pop with a lot under the surface. Not sure how to explain it, just feels good to listen to it. Honestly, that’s about all that I can think of for the year. If I am forgetting something it could be that it just didn’t stay on my radar, maybe enjoyable but not enough to keep me returning to it. Like most years, there were things that were new to me even if not new, flip through the archives for those things, I tend to put up clips as I find them. Here’s to 2015 – looking forward to seeing what it has in store for us on the musical front.